However, often we fail to question some of the most basic assumptions. Recently, I have been experimenting more with the Kalita Wave. I have had the small glass version for a few years and always liked it even though I was more into the Hario V60. Since I wanted to brew larger batches, I got myself the iconic stainless steel Kalita Wave 185. However, I experienced something quite odd: The steel version seemed to percolate a lot slower and more unpredictable than my usual glass model. Puzzled, I conducted a simple experiment to see whether there was any actual difference between the two. Then I measured how fast it would drain. I was quite astounded: The small glass version drained 83 percent faster than the metal version. I then got my hands on the 185 Wave in ceramic and did the same experiment. Once, again I was surprised; this brewer also acted differently, however not quite as dramatically. By now I was convinced that all Kalita Waves had their own personality and flow rate. The only thing they seemingly had in common was the name. 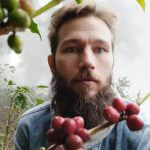 I reached out to some of my good coffee buddies on Instagram (thank you, guys 🙏) and asked them to perform the same experiment with their versions of the Kalita Wave. More water pouring ensued, and eventually they got back to me with additional data to confirm my hypothesis: Not all Waves are the same! Glass 155 – 30 sec. Glass 185 – 28 sec. Ceramic 155 – 38 sec. Ceramic 185 – 36 sec. Stainless Steel 155 – 55 sec. Stainless Steel 185 – 55 sec. Tsubame 155 – 33 sec. Tsubame 185 – 33 sec. The above measurements don’t say anything about which model is brewing better coffee. All it is saying is that the Kalita Waves are somewhat different. Notably, the stainless steel model is an outlier. It’s almost double as slow compared to the Glass 185 Wave. 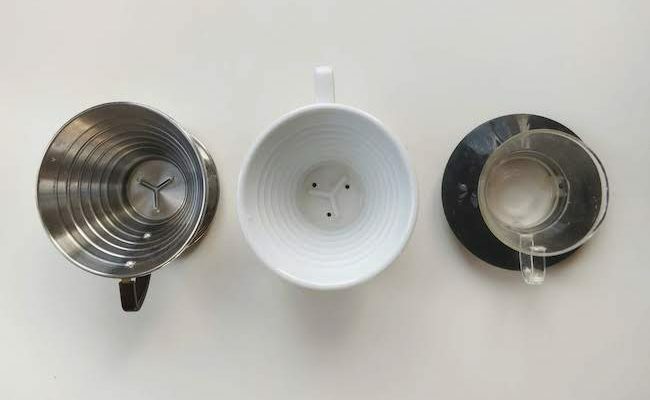 A skilled barista would probably be able to overcome these differences by adjusting grind size and pour speed; however, it’s problematic when Kalita Wave recipes are shared as if there’s only a standard model. The skeptical reader might say that pouring water into an empty cone doesn’t prove anything, so to counter that argument I did the same experiment with a pre-wet filter in the dripper. Again, the results were starkly different. Glass 155 – 56 sec. Ceramic 185 – 62 sec. Stainless steel 185 – 92 sec. 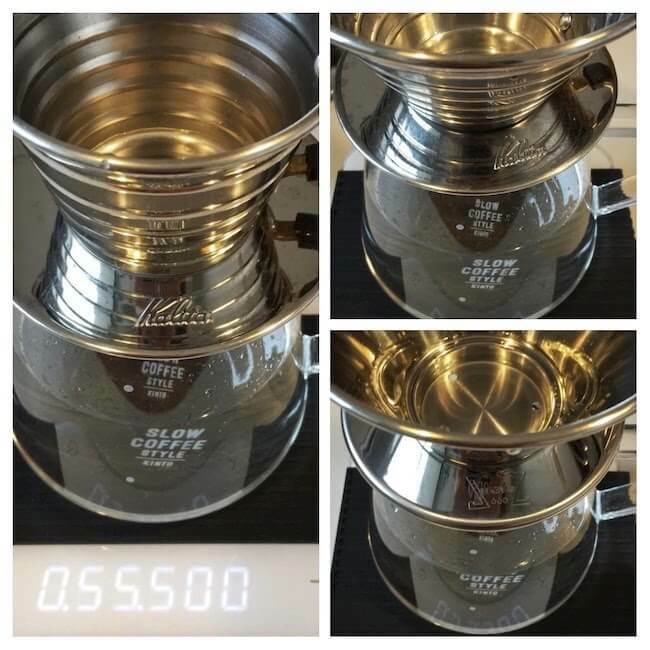 Clogging Kalita Wave 185 & 155? My personal experience brewing with these different models aligned nicely with the test results. The stainless steel version is a lot slower than its siblings. In addition, both I and other homebrewers have noticed that it tends to have clogging issues. This happens when the combined weight of water plus saturated coffee grounds pull the paper filter down so it covers one or more of the drain holes. This is especially prone to happen if you follow a multi-stage pouring recipe (i.e. more than 2-3 pours). I questioned my coffee geek friends about this, and the general opinion was that both the stainless steel version as well as the Tsubame version had this issue, while the glass and ceramic ones were unlikely to get clogged. The ceramic version has three protruding ribs meant to raise the bottom of the filter. The stainless steel model has the same ribs, however, they are much more shallow. The glass version has a design, where the center of the bottom is raised slightly, which makes it almost impossible for the paper filter to block the drain holes. The Tsubame is similar to the glass version, in the sense that it doesn’t have ribs. However, the bottom is less convex. Sidenote: It seems there are two different models circulating of the Kalita Wave stainless steel: One with more protruding ribs and slightly faster flow, as well as the more widespread one featured in this article. If you’re interested in brewing with a Kalita Wave, I’d suggest going for one that drains rather fast and doesn’t have the clogging issue. That leaves us with ceramic and glass options. However, the glass version is rather fragile, so if you’re the least bit clumsy, I would avoid that model. Leading up to this experiment, I bought the bigger glass version but broke it after only two days of use. The 155 glass version should be more sturdy since its plastic cap protects it better and it has a better weight distribution. On both versions, the plastic caps are of identical size. However, the 185 is much larger so technically it’s a lot more exposed. To back up my point, I’ll add that I have had the 155 glass version for about 2,5 years, without any accidents so far (knock on wood). The ceramic version will be susceptible to breaking if you drop it from a distance, but it should withstand small blows from daily use. With all these considerations, I think the ceramic Kalita Wave offers the best combination of usability and longevity. The only downside is the weight; at 317/365 grams (11-13 oz), it’s not exactly ideal for travel.